Let’s be honest – brunch is terrible. The food is average; the drinks are watery and dreadful. And you most often WAIT for the privilege! Time to re-do brunch. 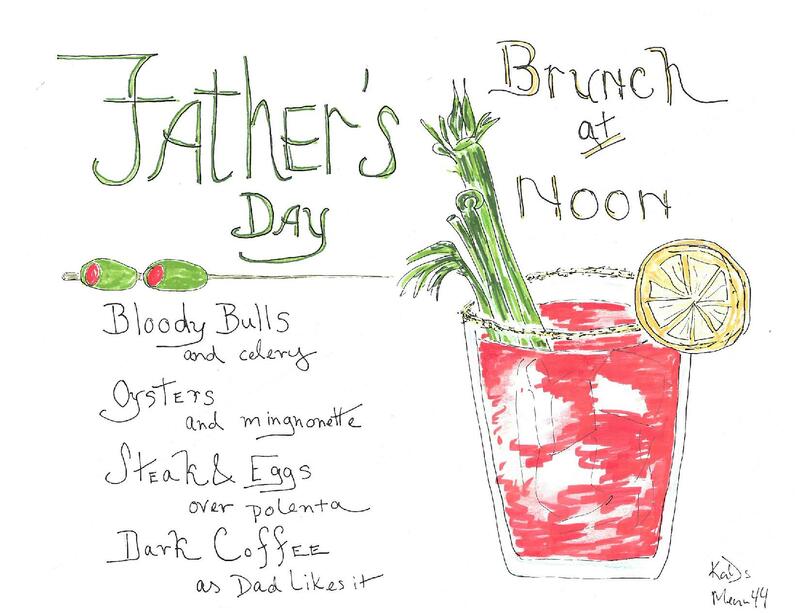 And what better time to re-do brunch than on Father’s Day. Time to make brunch a real meal, in your home – and today, a meal that puts hair on your chest. This is not a brunch for the faint of heart. This is a brunch for DADS. Start strong with a Bloody Bull. Bloody Bulls are a riff on the bloody mary – but better. We’re talking beef broth (stop – just stop – listen to me). Read the link below for why bloody bulls are superior to the average bloody mary. Your dad is superior – he deserves this. Next, oysters. I said put hair on your chest. Oysters will do it (and I bet your dad will NOT be expecting oysters. A little surprise never hurt anyone). For the main event, Steak and Eggs. “Steak and eggs” are a father favorite in my house. Serious protein. A real meal. But let’s fancy it up some and serve the steak and eggs over spinach and OVER polenta (over over!). This is the way to eat eggs. And of course, coffee. But frankly after eating all of this what you really should do for your dad is prop him up in the best chair in the house, hand him a remote and the paper and keep those bloodies on refill. He will probably nap. And one of the best things you can ever give a dad is a nap (same with moms). Plan a little, and get this done for your pops. I get it – you were over-served. Someone spiked your green beer you spent the weekend hungover. You hate Ireland and vow to never ever chase leprechauns and pots of gold again (while consuming copious amounts of alcohol). St. Patrick’s Day went from a Christian holiday to, let’s say, a religious experience where you ended up worshipping the porcelain god. Time to redeem yourself. Time to reconnect with all that is good and Irish and enjoy the wonders that come from that beautiful country. Friends, time for Traditional Full Irish Breakfast. Yes, now that the green haze is wearing off, invite your ne’er do well friends over this Saturday for brunch and go back to the land. The Irish know how to start the day. 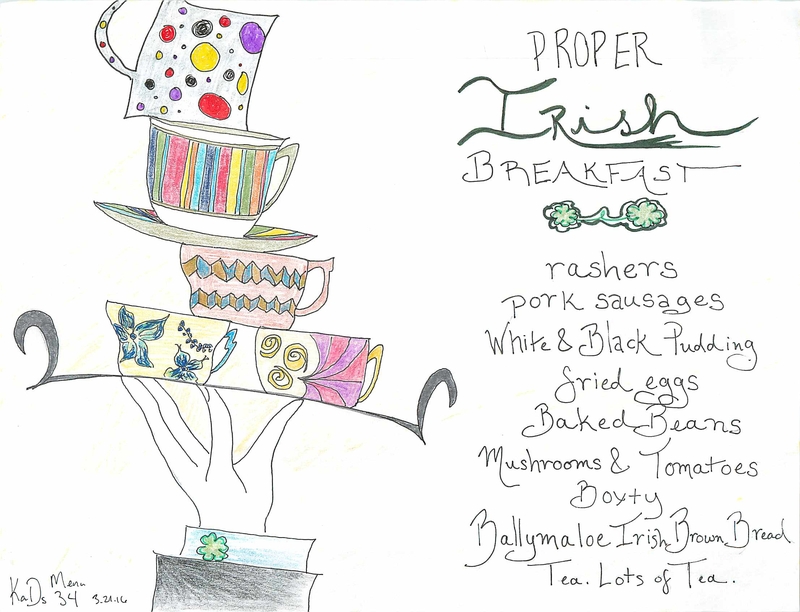 Pretend you’re in an old Irish manor house and serve a Traditional Irish Breakfast. This breakfast is meant to last you through much of a long cold work day. It’s got several types of sausages, bacon, fried eggs, baked beans, tomatoes, mushrooms and bread and ALL of the above (ex the beans) has been thoughtfully fried up in good old Irish butter. Procuring traditional white and black (i.e. BLOOD) pudding (sausage) might be hard – if you have time, order blood sausages online. If you skip that part and stick with regular pork sausage, I won’t tell. The beans – you can make your own or you can buy the canned version. Eggs are easy, fry them up preferably in the same pan you’ve fried up the meats and the mushrooms/tomatoes. Not a ton of cooking to be done here (you are recovering, after all) but I would urge you to try to make this low maintenance and delicious bread. The idea here is to eat enough to feel better about leprechauns. Wash all of that down with copious amounts of good dark tea, and begin to feel happy and lucky again. HERE is a wonderfully descriptive breakfast cooking plan (though it doesn’t include beans but how hard is it to add them? Dump a can of beans on a pot and you’re good to go. Excellent hangover food). I might skip the Boxty as that seems like more cooking than I want to do, but that’s just me being not fully Irish. ORDER White and Black Pudding. 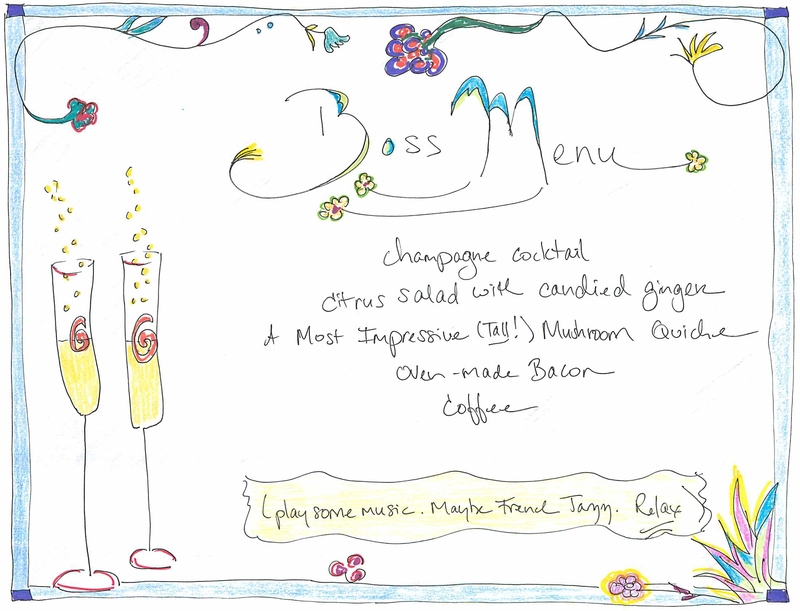 Menu 11 – Your Boss Is Coming For Brunch! It’s important not to look frazzled in front of your boss. But you feel compelled to have her over and (not look frazzled) serve a meal. The best plan here is brunch. Risk of drinking too much and acting crazy – LOW. Risk of ruining the meal – ALSO LOW ASSUMING SHE EATS BACON. Risk of yawning because you’re tired from a long night – LOW. Let’s get started. The key here is ease of use plus creativity. You could do bagels and salmon – but everyone does that. Try this instead – a not too scary yet impressive quiche. We’re going tall here (springform pan = impressive). Bacon, which you will cook in your oven so your stove isn’t a splattered mess. A little fruit is always nice and pretty…adding candied ginger gives it an “oh wow what a nice touch” sentiment. Drinks – risky but let’s assume you don’t work for a fuddy duddy. Go ahead and serve an eye opener like champagne with a dash of bitters and a twist of orange. And of course, coffee. WHAT? You don’t know how to make Bacon In Your Oven? Menu 47 – Middle East FEAST! Menu 45 – 10th Anniversary Feast!! !